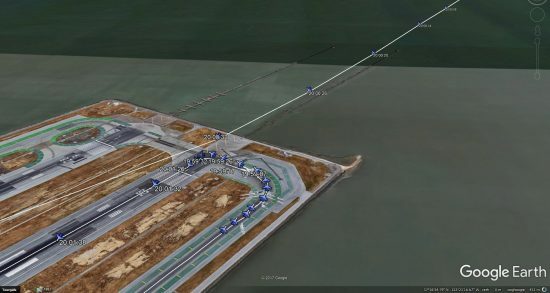 The NTSB has started an investigation into two serious night-time runway incursion incidents at San Francisco Airport, California. On 14 December 2016, a runway incursion occurred when SkyWest Airlines flight UA5086, a CRJ-200, crossed the runway hold short line to runway 28L at the taxiway Juliet intersection while flight UA517 was on takeoff roll. Night visual meteorological conditions (VMC) prevailed at the time of the incident. Flight UA5086 was a CRJ-200ER, registered N986SW, operating on a flight to Ontario International Airport, California. Fight UA517 was a Boeing 737-924ER, registered N62849, operating on a flight to Washington-Dulles International Airport, DC (IAD/KIAD). Official data has not yet been released. ADS-B data from both flights as recorded by Flightradar24 suggests flight UA5086 had crossed the hold short line at 17:42:54. Six seconds later the aircraft was just short of the edge of runway 28L. 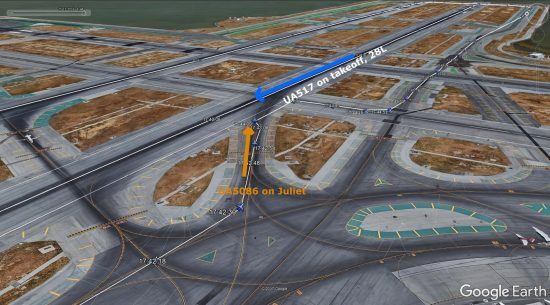 Flight UA517 had initiated the takeoff roll at 17:42:36 passing Juliet at 17:43:06 at a speed of 160 knots. The second incident occurred on February 15, 2017, on runway 28L, when Virgin America flight VX920 was on a line up and wait clearance issued by the local air traffic controller and Compass Airlines flight AA6081 was cleared to land on the same runway. The air traffic controllers received an Airport Surface Detection System Model X (ASDE-X) alert and commanded the Compass flight to go-around, and the crew subsequently performed a go-around maneuver. Flight VX920 was an Airbus A320-214, registered N627VA, operating on a flight to Las Vegas-McCarran Airport, Nevada. Fight AA6081 was Embraer ERJ-175LR, registered N214NN, operating on a flight from Los Angeles International Airport, California. Night visual meteorological conditions (VMC) prevailed at the time of the incident (KSFO 160356Z 20019KT 10SM FEW100 BKN120 BKN180 16/04 A2999 RMK AO2 SLP155 T01560039). Official data has not yet been released. ADS-B data from both flights as recorded by Flightradar24 suggests flight VX920 was at the hold short line at 19:59:17 LT. At that time AA6081 was 3 NM from the threshold, at about 850 feet. At 19:59:32 VX920 had entered the runway and was in the process of lining up. At that time AA6081 was 2.4 NM from the threshold, at about 675 feet. ADS-B data suggest that AA6081 descended until at least 75 feet at 20:00:26. During the go around manoeuvre, the ERJ-175 crossed the paved surface short of the runway threshold at 100 feet and continued to climb, carrying out a safe landing 20:11.